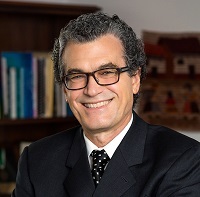 Eliseo J. Pérez-Stable, M.D. is Director of the National Institutes of Health’s National Institute on Minority Health and Health Disparities (NIMHD), which seeks to advance the science of minority health and health disparities research through research, training, research capacity development, public education, and information dissemination. Dr. Pérez-Stable practiced general internal medicine for 37 years at the University of California, San Francisco (UCSF) before moving to NIH in September 2015. He was professor of medicine at UCSF and chief of the Division of General Internal Medicine for 17 years. His research interests include improving the health of racial and ethnic minorities and underserved populations, advancing patient-centered care, improving cross-cultural communication skills among clinicians, and promoting diversity in the biomedical research workforce. For more than 30 years, Dr. Pérez-Stable led research on Latino smoking cessation and tobacco control policy in the United States and Latin America, addressing clinical and prevention issues in cancer screening, and mentoring over 70 minority investigators. He has published over 250 peer-reviewed articles and was elected to the National Academy of Medicine in 2001.